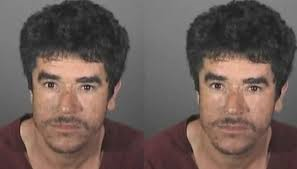 Authorities are now in hot pursuit of a Southern California man who is suspected of attacking his wife with a chainsaw in front of their own children before fleeing on Wednesday. The Whittier Police Department said officers responded to reports of a domestic violence incident at the couple’s home in the 7700 block of Milton Avenue in Whittier around 3 p.m. The officers found the woman suffering from traumatic injuries. The officers also said that the woman was taken to a trauma center in critical condition. The husband and suspect has been identified as 32-year-old Alejandro Alvarez. He fled from the scene in his SUV, but which he later crashed. Officers said that Alvarez swiftly stole a vehicle next that was left running in Mayberry Park. Neighbors said the woman ran out of her home, screaming for help. Enrique Avila said he heard a woman say, ‘leave me alone or I’m gonna call the cops.’ Avila said that after that, he heard little kids inside the house. Another neighbor, Fernando Jauregui, said he saw the victim with cuts on face and neck, and appeared to be losing a significant amount of blood. Authorities said the suspect was last seen in the stolen 2004, blue Mercury Mountaineer. The four-door SUV has a California license plate No. 8ABD233. Officers described Alvarez as 5 feet 3 inches tall and weighing 130 pounds with black hair and brown eyes. He was last seen wearing dark jeans and a brown Hurley t-shirt. The police recovered a chainsaw, but stressed that the suspect remains possibly armed and definitely dangerous. They are asking anyone who would come in contact with him to avoid the man as much as possible and to call 911 for information about his whereabouts and other important information. Neighbors said the couple have three elementary school-aged children, who they think are now in protective custody. Anyone with information about Alvarez may also call detectives at 562-567-9299. Meth! Drugs coming through México are mixed and causing sucidal and lots of domestic violence. Violence has been on the rise. Well was the chain saw running or did he hit her with it? lock him up, he must be an illegal! CA, his name, and his actions point to another fine addition to the CA citizenry.